After a while, going through bottle after bottle of TPD-compliant 10ml e-liquids with nicotine becomes tiresome. A much more cost-effective way of using e-liquid is by moving onto shake and vape shortfill e-liquids…it’s better for the environment too! 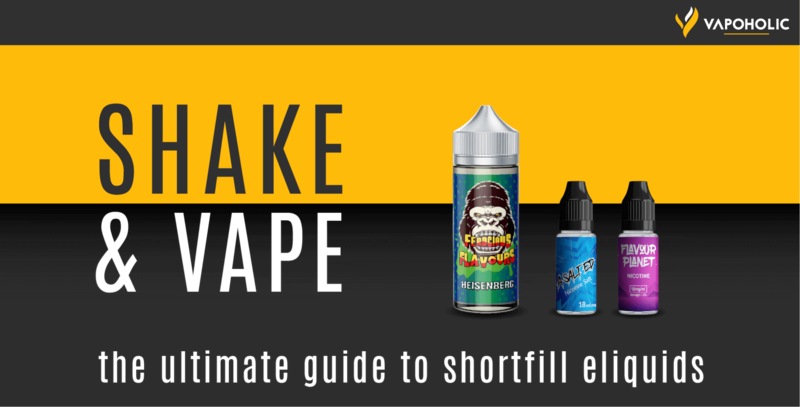 In this post, you’ll learn everything you need to know about the wonderful world of shake and vape shortfill e-liquids to help save you time and money! What are shake and vape shortfill e-liquids? The Tobacco Products Directive (TPD) has, since 20 May 2017, prohibited the sale of nicotine-containing e-liquid in containers over 10ml. When you purchase a 10ml bottle of e-liquid, it will come with the amount of nicotine you chose already added. That’s all well and good, but it’s not exactly buying in bulk. A typical vaper will go through a 10ml bottle of e-liquid every 7 days and perhaps more with a modern sub-ohm tank…that’s a lot of bottles over the course of a year! Now, we’re not saying 10ml e-liquids are bad; they suit some light vapers, but if you really want to stretch your money and be in more control over your nicotine strengths you should look into shake and vape shortfill e-liquids. Shake and vape e-liquid is still the same high-quality e-liquid as you would find in 10mils but comes without added nicotine. This means it can be sold in sizes of 60ml, 100ml and 120ml and remain TPD compliant. Of course, this doesn’t mean you vape nicotine-free e-liquid if you buy a shortfill. The bottles are purposely filled to less than their fill mark for you to add separate 18mg/ml nicotine shots to your desired strength hence the name “shortfill”. This gives you much more control of your nicotine strength, and as long as the nicotine shots come in 10ml TPD-compliant bottles, everything is well within the law. How many nic shots do I need to add to shortfill bottles? 3 or 6mg/ml of nicotine tend to be the most popular strengths for vapers and are most suited to modern sub-ohm tanks. For more information on nicotine strengths, see our Beginner’s Guide to Vaping. Don’t worry about diluting the flavour of your e-liquid with the added nic-shots either; shortill e-liquid is supplied in a concentration to match the amount of nicotine to be added. The more nicotine shots to be added, the higher the concentration of the e-liquid. Another benefit of shake and vape shortfill e-liquids is that you can also get to choose between standard (freebase) nicotine or nicotine salts. See our post on Nicotine Salt vs Freebase to learn more about the differences between the two. How to shake and vape? So, now you know what shortfill e-liquid is, what do you do when you get it? Pour in the supplied nicotine shots. Close the lid and shake vigorously for 60 seconds (shake and vape, you see!). You can vape straight away, although some people prefer to let the eliquid steep for 24-48 hours, especially for 6mg/ml strength, for the taste to become smoother and reduce any harshness caused by the nicotine. Letting the bottle steep with the top removed can help speed up this process. Get shaking and vaping today! Shake and vape shortfill e-liquids are a great step up from 10mils. Not only do they save you time and money and give you more control over nicotine, they are also much better for the environment. So what are you waiting for? Get shaking and vaping today! P.S. If you would like to try out an e-liquid flavour before buying a shortfill, pick up one of our tester bottles here. Sign up to the Vapoholic newsletter below and receive our latest deals, flash sales, new e liquid flavour releases and up to date vape culture and vape industry news delivered straight to your inbox. You’ll also receive 10% off your next order! Have you recently switched to shake and vape shortfill e-liquids? How do you find it compared to 10mls? Do you have a favourite flavour of shortfill e-liquid you can recommend? Let the community know in the comments below. Are Sweet E liquids Encouraging Children to Vape? Jan on Facts About Vaping – Who Can You Trust?